A Canadian Treat given to us by the Latvians. Who doesn’t love bacon? I have just come across a recipe that pairs two of my favorite flavours and foods. 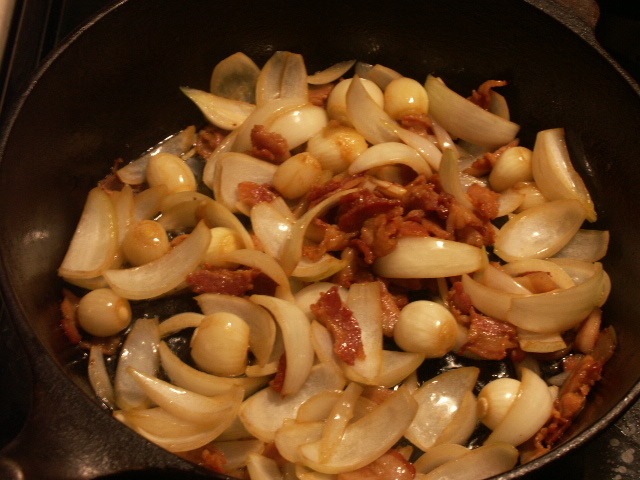 Bacon and onions….In Canada we are looking at a long weekend coming up Aug. 3rd. So to make the weekend really memorable, I try to find something that takes a little longer to make (because now I have the time) and something that my family will really enjoy. Enter into my cookbook, the recipe just added called Piradzini or Latvian Bacon and Onion Stuffed Rolls. If you love onions and bacon, this is a must recipe for you! First we will place the potatoes, water and salt into a saucepan and boil for 15- 20 minutes, until potatoes are tender. Drain and reserve the liquid. Mash the potatoes thoroughly and add the sugar, butter and reserved water. Let cool until it is lukewarm. flour to make a stiff dough. Turn dough out onto a floured surface and knead, add flour as you knead to keep dough from sticking to the surface. This should take about 4 to 5 minutes. Place the dough into a well oiled bowl and cover with a damp clean towel and let it rise. (A great place to do this is above your refrigerator) In about an hour to an hour and a half it should have doubled in size. While this is happening, we are going to prepare the filling. In a heavy saucepan, cook bacon, onions, green onion, diced ham and pepper until the onion is softened and the bacon begins to crisp. Let this cool completely! Now back to our dough: When it has doubled, punch it down and divide the dough into 16 pieces. Roll each piece to flatten it slightly. Place a spoonful of the cooled bacon mixture in the center of the dough. With your fingers pinch together the dough to form a crescent shape and place on a parchment lined baking sheet. When you have all 16 ready, use a really sharp knife to “slash” the tops of your rolls. Two or three “slashes” are fine. Cover the prepared buns with another clean towel and let stand for 1 hour, to rise again until doubled. Whisk your egg yolk and milk and use this wash over the buns until they are fully glazed with the coating. Bake in a preheated oven 375 degrees (190 c) for about 15 to 20 minutes until they are golden brown. I bet the whole family will be waiting with water in their mouths……. Just for fun you can use this dough recipe and add other fillings too. Don’t be afraid to experiment, I bet you can come up with some dandy fillings too! Best of all, once they are ready, enjoy!